Herding Cats: Girls Night In. This Friday Craig went out to Manchester for a Sony Ericsson reunion night out, thus leaving Mooms, Freya and myself free to gatecrash Nic and Nick's. What a logistical nightmare. There was all Freya's stuff including the pop up cot which Craig had to teach me how to fold, at half eleven at night. If you twist it the wrong way, it suffers a terminal malfunction apparently. Moomin needed food and her bed packing. She also had to have a bath before being in polite company. After packing all that crap, I could barely be bothered to pack a toothbrush and change of clothes for myself. I managed a bag of maltesers and a bottle of Viogner though. Becky and James were over from Sheffield with their two children, Faye and Owen. 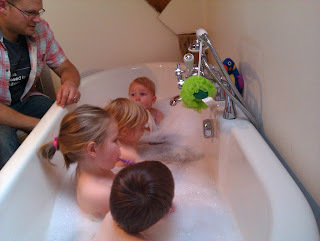 Four children under five to bath and get to bed, sounds chaotic huh? Luckily for us, Nick has a big roll top free standing bath. They all sat in it facing the same way, looking like they were waiting for the 563 to Bolton but job done. It felt weird as I was for all intents and purposes a single mother while everybody else 'tag-teamed' their children to bed. However, Freya was a peach and I still managed to bag a spot by the fire with a glass of wine in my hand before the others. I feel a little smug that we have ditched our baby monitor as Freya continues to sleep from seven till seven. Poor Elodie continues to struggle with her teeth and was waking three hourly for Calpol. Owen can also be unpredictable at night too. By nine o clock we were sat round with a chinese and a few beverages, chatting about work colleagues having affairs and other earth shattering stuff. Just what the doctor ordered. I was wearing the white linen maternity pants that Becky had lent me, feeling a bit odd wearing summer clothes in front of the fire (at the end of September)but luckily Becky was also wearing white pants because she wanted to give them their last outing of the year. I completely understood (the strange things women do).